This week we are delighted to share a post written by one of our very own board members, Don Llewellyn. Enjoy! 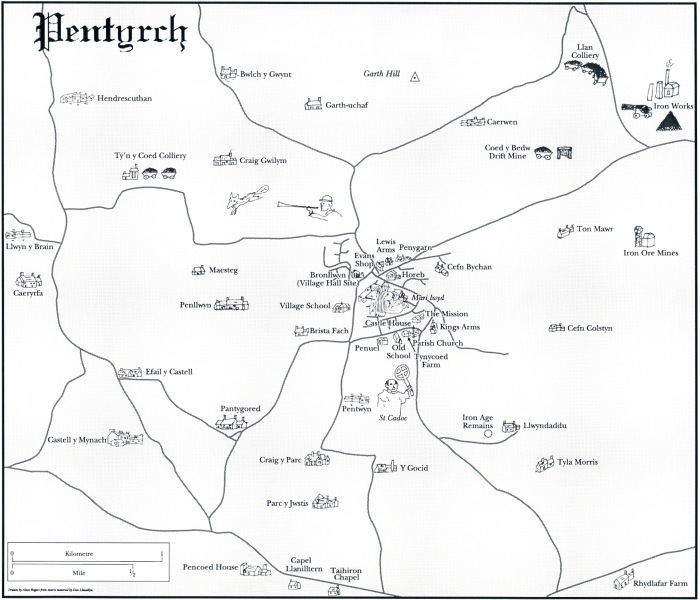 I slipped into this world in the Glamorganshire hill-village of Pentyrch at about 10 a.m. on the morning of 8th of May, 1933 and for some time remained rather confused about it all. For years afterwards I had a recurring dream in which I watched myself being delivered up the garden path by the District Nurse carrying me over her arm in a wicker basket. I was eventually disabused of this fantasy by those around me who insisted that I had arrived by the normal route. I believe it was my god-fearing aunty, Bopa Meia from next door who actually cut and tied what she insisted on calling the ‘biblical’ cord. Thus my journey really began. Almost even before I was slapped into producing my first cry, the news had spread around the village and reached my five-year-old brother who was playing rugby among the cow-pats on Clawdd Shôn field. He raced home to receive the disappointing advice that it would be ‘yet awhile’ before his sibling could join him in the local rough and tumble. The newly-arrived would, of course, soon be able to cope with the lesser demands of the round-ball game, but rugby would take a little longer. My parents had named my brother after our greatest hero: ‘Arthur’. Now, they decided that the world’s leading cricketer would have to share his name with me. Hence, I was lumbered for life as a ‘Donald’. As this sat uncomfortably with ‘Llewellyn’, I would soon begin lying that my first name was actually ‘Don’. My second name ‘Richard’ was in deference to my father’s father who lived with us. Although he died before I was twenty months old, I swear I can remember him leaning over my pram, smiling broadly beneath a handlebar moustache, and repeating through a cloud of pipe smoke: ‘Rhysiart annwyl, Rhysiart annwyl’ (Dear Richard, Dear Richard). He had little (if any) English. I have many vivid memories of the years between my arrival and my first day at the village school. There were several pivotal events which began shaping the person I was to become. I still have a feeling about the way people thought and acted in the 1930s. Even certain colours bring back instantly some memory or other that relates to the lifestyle and the prevailing mood of that decade. There had been a leap ‘forward’ in almost every aspect of life since the 1920s. Cars (though still few) had become more streamlined; aeroplanes were now regarded as if they had been here for ever; clothing fashion, which a decade earlier had finally thrown off any remaining vestiges of Victorian prudery, had now settled into a recognisable ‘modern’ style of smart but utilitarian dress. Above all, there was the influence of American films, which, since the advent of ‘talkies’ had begun to condition Britain with regard to everything from popular music to speech patterns. Even those around me whose first language wasn’t English were affected. 1933! Needless to say, many events of that year would have a far greater impact on the world than would my birth. In the U.S.A. Prohibition ended; construction of San Francisco’s Golden Gate Bridge commenced; the original film of King Kong was released, and one Giuseppe Zangara, attempting to assassinate F.D. Roosevelt, missed, and shot Chicago Mayor Anton J. Chermak instead. Radio waves were detected from the centre of the Milky Way by Karl Jansky. In India, Gandhi was on hunger-strike. In Venezuela, Jimmy Angel became the first foreigner to see the world’s highest waterfall. The International Court at the Hague declared that Greenland belonged to Denmark. In this same year, Albert Einstein arrived in the United States as a refugee from a rapidly worsening political situation in Europe. Adolf Hitler had been elected Chancellor of Germany and the obscenities of Nazism began with his ‘Proclamation To The German People’. Before spring was out, Dachau, the first Nazi concentration camp was completed. With little knowledge of the further horrors to come, people here took pleasure from other matters, including the first modern sighting of the Loch Ness Monster. In the U.S. great excitement was caused by the invention of such life-changing items as the ice-cream cone and the chocolate-chip cookie! Among those taking their first breaths with me that year were film actor Gene Wilder (to whom, I am told, I bear a wrinkly resemblance in old age), Michael Caine, Joan Collins, Kim Novak, Philip Roth, Jayne Mansfield, Marty Feldman, and the Kray gangster twins. There was also someone called Conway Twitty, who, I understand, is, or rather, was, some kind of country music artist − and Emperor Akihito of Japan about whom the less said, the better.